Window boxes can be an amazing addition to your home landscape, and they’re much more flexible and versatile than many gardeners realize. Take advantage of this great space and you’ll soon be wild about window boxes! There are many types of window boxes available, from classic rectangles to wire frames with coir or sphagnum moss inserts. Wood and plastic boxes are also available, and they can be half-circles, have rounded ends on a longer box or may even be smaller boxes with pointed bottoms, a cone shape, suitable for just one or two favorite plants. While most window boxes are designed to be mounted beneath a window, they can also be positioned on a fence, deck railing or even a sunny patch of wall to add more beauty and growing space. When choosing the best window box for your home, coordinate with the architecture of your house for a smooth, elegant look. Ideally, the box should be the same length as the window or just slightly shorter, but not so short that it looks out of place or unbalanced. Window boxes come in a variety of popular or neutral colors, and some boxes can be painted to match your house’s window trim or siding exactly. When mounting the box, be sure it is securely supported so it will not tip or fall. Larger, heavier boxes may need additional brackets underneath to support the weight of a full box, taking into account not just the weight of the box itself, but also of the soil, water and mature plants. 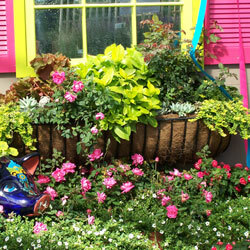 Any plants that are comfortable in small or medium-sized containers can thrive in window boxes. You may want to opt for flowers for a colorful accent to your home, or choose herbs, berries or even lettuce for a kitchen window box that will be easy to harvest. 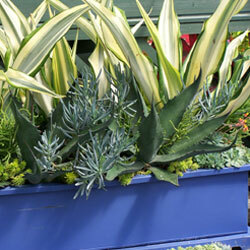 Small ornamental grasses and spreading ferns or spider plants are ideal choices for a green window box. 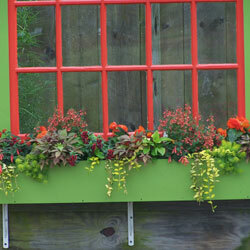 No matter what plants you choose, be sure they are suitable for the climate of the window box. Consider the amount of sun the box receives and when it may be shadowed throughout the day. Also note that window boxes against walls or fences, as opposed to boxes on railings, will receive more heat if the wall is dark in color. If the wall is white, it will reflect more light onto the plants. Take not of overhanging roofs that will prevent rain from reaching your window box. Supplemental water will be a necessity in this case. You can use just one type of plant in a window box for a bold statement, or you may prefer a mixed container that combines textures, shapes and color for a more dramatic look. Consider mounding plants that will easily be seen above the edge of the box, or trailing varieties that will gracefully drape over the box and soften any harsh edges. Symmetry and balance can be important in window boxes, so be sure to envision how the plants will look when mature so the entire arrangement will complement your home and other nearby landscaping. 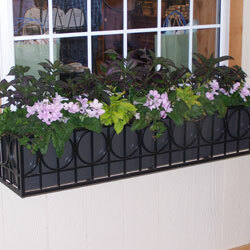 Just like any container, window boxes require unique care to allow plants to reach their full potential. Fortunately, if you mount a window box outside a window that can be opened, it’s easy to open the window for watering, weeding and pruning as needed. Use a rich potting soil that will provide abundant nutrition for the plants, and fertilize as needed for the type of plants you’re growing. A nitrogen-rich fertilizer is best for leafy plants and dramatic foliage, while a fertilizer that is heavier in potassium will encourage brighter blooms and more flowering. Because window boxes are containers, they will need more frequent watering, even daily or twice a day depending on the climate and how thirsty the plants may be. To make watering less of a chore, consider using automatic waterers such as watering bulb that will keep your window box properly hydrated. When you water by hand, a small watering can with a thin spout is best, as you’ll be able to get water directly to the soil without wasting precious water on plant foliage where it will do no good and has the potential to burn delicate foliage in a sunny situation. 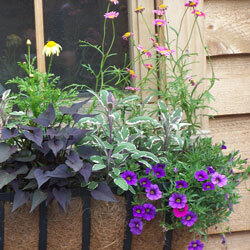 When tending window boxes, use small, hand-sized tools that won’t disrupt other plants in the crowded space. Thinning or pruning the plants regularly will help encourage new growth to keep the plants lush and the box full. If you’ve planted an edible window box with herbs or veggies, harvesting when the plants are ready will provide richer flavors and spur new growth to lengthen the growing season and increase the plants’ yield. While the plants in your box may be decoration enough, a window box can also be a great space to add extra decorative flair to your home. The box itself can be wrapped with a ribbon to add more color or coordinate with the current holiday. Decorative plant stakes or small garden flags provide bright accents that can be switched out with different seasons and holidays. You might even create a small fairy garden in a window box, with a quirky gnome or other whimsical figure peeking out from the fun foliage. In winter, pine boughs can be layered in the box for ongoing greenery along with colored or natural branches, and a small strand of lights can even be strung along the box for a glittering twinkle. If you prefer to light your box up year-round, you might even carefully place a solar plant stake or two in the box to highlight the arrangement. Window boxes are far more than just small planting containers – they can be beautiful accents to your home, an extension to your growing space and even a spot for fun whimsy in your yard. You can make them into whatever you like – don’t be afraid to go wild!